Email from Wilderness Center this morning...we got the GA permit! Many thanks to Phil and TA for your great comments and info! And thanks Phil for the link to the Compendium. I'll read through it. And I'll definitely get the Harrison map. So knowing location and status of hydration sources is one of my biggest concerns on a hike, especially on a trail I haven't hiked before. On the trail from GA to May Lake, am i correct in understanding that most/all of the creeks between GA and May Lake will probably be dry in early September? Since we have a straight GA permit I'm thinking we will be starting with full bottles and will make the hike from GA to May Lake in one day so refill shouldn't be an issue, but just in case it would be nice to know for pretty sure that Polly Dome Lake is really the only solid water source along the way. Phil, I think this is what you were saying but I just wanted to be sure I understood. Yes, that's pretty much what I'm saying. Everyone drinks differently. I would start from GA with a liter apiece. Filter it out of the Tuolumne or Conness Creek rather than using the faucet at the camp. They chlorinate it heavily and you can taste it. Skip McGee Lake because you won't need it, and it'll be stagnant and warm because of the depth. Next, you should have at least some flow at Cathedral Creek, so top off or refill there. You then climb about 700 ft between there and the junction of the Murphy Creek trail, so if you think you need more, go ahead and get it there. That area in between those two points has lots of creeks, but they flow very seasonally and shouldn't be counted on at all. If you do decide to load up on that second liter at Cathedral Creek, you won't have to divert that extra mile or so round trip over to Polly Dome Lakes, but they are nice and worth seeing. Your next guaranteed water source is Raisin Lake, about another 2+/- miles ahead. This is also a great place to find a campsite in lieu of May Lake- usually more private and less crowded than the backpacker's area at May. Good sites are on the north and west shores, not too far off the trail. It's where I'm camping if I'm on that trail, fwiw. From there to May Lake, carry a fresh liter. Top off at May Lake for the hike down to the Sunrise trailhead, then top off and add extra at Tenaya Creek if it's hot for the climb up to Sunrise Lakes. Don't underestimate how hot that 1100 ft ascent can be. I would suggest you camp at either middle or upper Sunrise Lake. Lower tends to be crowded and less private, but all are better and nicer than the HSC. Obviously, there's plenty of water at all three. The next morning, carry your standard liter apiece up and over to the Sunrise HSC. Top off there with their faucet and add another if it's hot and you think you'll need it. The meadow will be dry and Long Meadow Creek won't be flowing or standing by Sept, so that faucet by the dining hall is it. You have roughly 4 miles to upper Cathedral Lake, and I would strongly suggest you spend the night there. It's nice enough to make it a short day and hang out. Last morning, carry your liter apiece again. There will be a spring that's usually year round on the way down to the trailhead, but with 1L, I doubt you'll need to bother. Congratulations, you had a nice trip and stayed hydrated for all of it. Then go to the store and have a beer. Phil: You. Da. Man. !!! Thanks again (again) for the awesome intel. I'm way too embarrassed to admit the insane amount of water I packed up the trail on our first time up to Sunrise from Tenaya Lake, so having good knowledge about hydration points and the right amount of water to pack on the GA-May lake leg is a huge load off my mind (and back)!! How is the elevation gain from GA to Raisin lake? Is the strenuousness of that hike comparable to the hike up to Sunrise? Based on your comments I'm liking the thought of camping at Raisin Lake and then going through to Sunrise on the next hiking day. You kind of go in stages. From GA to to the crossing at Cathedral Creek is a slight incline that rolls up and down within about a couple hundred feet. Nothing too steep except the first part of the trail from the junction down below White Cascade and up to McGee Lake. From Cathedral Creek is where the only real climb is, and it begins to climb fairly steeply up to about 8400 within about 3/4-1 mile. Most of your vertical gain is here. You then go into a gentle uphill for about another 300 ft of gain at the Murphy Creek junction. More of the same for the next mile and a half or so when you reach a set of exposed switchbacks that take you to the top of, for lack of a name, the pass above Raisin Lake at about 9000 ft. From there it's a gentle downhill for about another 1/4 mile or so to the lake at about 8900. Most of the route is deeply shaded with a few exceptions, those switchbacks being one of them. So all said and done you end up with about 1000 ft of overall gain in about 6-ish miles. Not bad at all, and not even close to how hot and miserable that climb is up from Tenaya Lake to the Sunrise/CR junction. And you know, unless you have a hankering to see May Lake, and if you want to get in some cross-country practice that's manageable and safe enough with gentle and open terrain, and save a couple miles and some climbing in the process, you can follow the drainage or head to the SE from Raisin Lake and hit Tioga Rd down by Sunrise more quickly. Phil wrote: You kind of go in stages. From GA to to the crossing at Cathedral Creek is a slight incline that rolls up and down within about a couple hundred feet. Nothing too steep except the first part of the trail from the junction down below White Cascade and up to McGee Lake. From Cathedral Creek is where the only real climb is, and it begins to climb fairly steeply up to about 8400 within about 3/4-1 mile. Most of your vertical gain is here. You then go into a gentle uphill for about another 300 ft of gain at the Murphy Creek junction. More of the same for the next mile and a half or so when you reach a set of exposed switchbacks that take you to the top of, for lack of a name, the pass above Raisin Lake at about 9000 ft. From there it's a gentle downhill for about another 1/4 mile or so to the lake at about 8900. Most of the route is deeply shaded with a few exceptions, those switchbacks being one of them. So all said and done you end up with about 1000 ft of overall gain in about 6-ish miles. Not bad at all, and not even close to how hot and miserable that climb is up from Tenaya Lake to the Sunrise/CR junction. Hey now that I have a hike plan in mind I'm thinking about food. We have a BV500 cannister but I'm wondering if that will be big enough for five nights for two. I guess we can pack our Day 1 food outside the cannister, but that leaves four nights for two. Its been so long since our last trip I've lost all sense of foodplanning and packing. Assuming MH meals for dinners, tuna/tortillas for lunch and oatmeal for breakfast, and snacks, and if it turns out 4 days/nights for 2 doesn't fit, I've heard it's OK to stash food at Bearbox YE02 at Tenyaya Lake to pick up on the way up to Sunrise. Is this right, and would experienced hikers stash food at YE02 (i.e. its a more public box than a HSC box, it would be a real burn if the food wasnt there when we hit Tioga). Is there much bear activity at/near the GA HSC? Thanks...I know I may be "overthinking" and all the food will probably fit, but I'd like to be as foodsmart as possible while following all of the rules. I have stashed food in those "community bear lockers" for post trip meal at trail heads. Never had them taken. I always "deflate" freeze dried meals to save space. Keep in mind that you have to store toiletry items in you bear can as well as trash (empty freeze dried packets). EdelKev wrote: Phil: You. Da. Man. !!! Thanks again (again) for the awesome intel. I'm way too embarrassed to admit the insane amount of water I packed up the trail on our first time up to Sunrise from Tenaya Lake, so having good knowledge about hydration points and the right amount of water to pack on the GA-May lake leg is a huge load off my mind (and back)!! To me both are strenuous. If you want go to caltopo.com to see trail profile (distance and elevation). 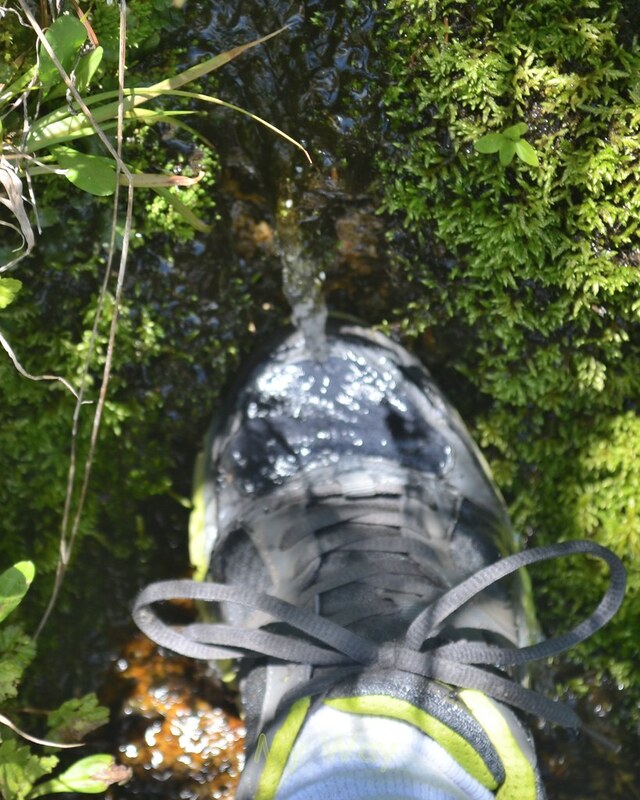 There are 2 small water springs on the way up to May Lake. One is about couple hiking minutes before picture below. The water is cold and clear (of course you need to filter it). Keep in mind that this was in early July. Here is my trip report if you want to get an idea. I don't carry a BV, but 700ci is supposed to be good for 7 days of food for one person. With MH meals, you can always repackage to pick up space. Test load it at home. But, I would go ahead and stash the food for my second leg at Sunrise, just to save weight, especially since you're going past there on the way to Tuolumne anyhow. It's rare when people mess with it, and there are half a dozen or more lockers down there, so squeaking in your stuff shouldn't be a problem. Just don't leave it in anything nice, and just use a crappy bag or beat up stuff sack to store it in. Bears are everywhere, but I've never heard of them being an exceptional problem at GA. Raisin Lake, I've never had a problem. May Lake, not unheard of. Sunrise Lakes/HSC, don't be surprised at all. Same with Cathedral Lakes. They're really nothing to worry about if you keep your food and toiletries tight. No worries...they're actually kind of fun to watch beating your can around, as long as they're not getting into it. When you get your map, have a look at that xc route down from Raisin Lake, and remember that with the Harrison map, those are 80 foot contour intervals. It's roughly just a little over a mile, but it's open slabs and lightly forested, and even if you get "lost", it's one of those places where you'll eventually stop out at the road somewhere if you keep going downhill. Your wife might be nervous about not following the trail, but she'll be stoked when it works out, and it's virtually a given. It's sort of a unique thing...a little extra adventure within the adventure. And, she'll think that "You. Da. Man." Paddy wrote: Here is my trip report if you want to get an idea. Phil wrote: I don't carry a BV, but 700ci is supposed to be good for 7 days of food for one person. With MH meals, you can always repackage to pick up space. Test load it at home. But, I would go ahead and stash the food for my second leg at Sunrise, just to save weight, especially since you're going past there on the way to Tuolumne anyhow. It's rare when people mess with it, and there are half a dozen or more lockers down there, so squeaking in your stuff shouldn't be a problem. Just don't leave it in anything nice, and just use a crappy bag or beat up stuff sack to store it in. Awesome intel Phil, as always! "Open slabs, lightly forested"...that's exactly what I was hoping you'd say! 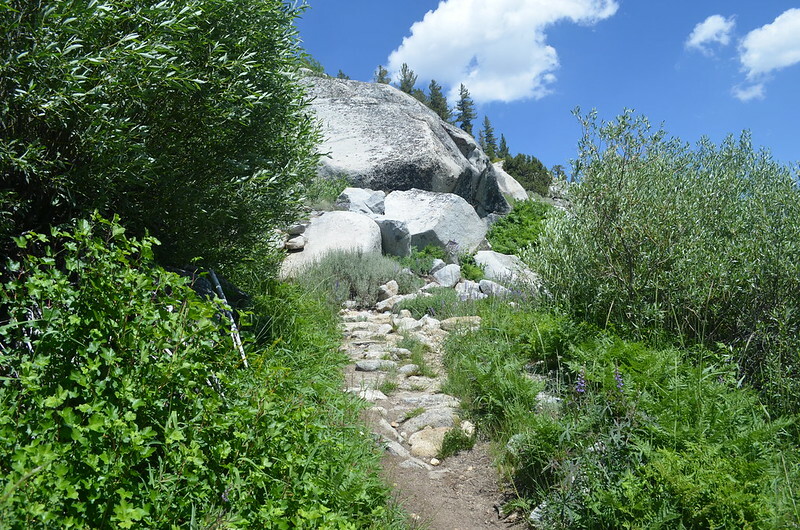 I am stoked about having a relatively newbie-Proof xc route to try on this hike. We've done Sunrise and Cathedral before, and the xc bit will be an nice bit of newness for the trip in addition to seeing GA and Waterwheel for the first time. Yeah, I enjoyed Paddy's TR too (thanks Paddy). I may be mistaken, but I believe that photo is of the switchbacks headed up to the pass right before Raisin Lake. The cross-slope looks familiar, although the last time I did it it was covered in snow and pouring rain. You can see that it's pretty exposed, and if you do decide to go up to May Lake, you can expect another stretch, just without the cross-slope, but you get some idea of what to expect. Waterwheel Falls will have considerably less flow in Sept, but that entire complex of falls is gorgeous anytime and worth seeing. Try to leave your gear at GA and day hike it, leaving early, so that you don't have to climb back up with a full load on and do what you can to beat the midday heat. But talk about staying hydrated! That canyon is blazing hot, and once you come out of the trees above California Falls, you're in all the direct sun and reflected heat that it has to offer. Still, worth an extra night at GA to see. Lot's of places to swim, and if you leave part of your food supply at Sunrise, you'll have plenty of room in your can for it. Thanks Phil. The Satellite imagery was great, and thanks for the extra comments. It looks like a fun xc hike. Looking forward to it! No, after July the mosquitoes aren't an issue, and by Sept, they're gone. Head nets are never a bad idea, though. They cost, weigh and pack to nothing, so just stuffing one in your pack and always leaving it there is good. Phil wrote: Yeah, I enjoyed Paddy's TR too (thanks Paddy). 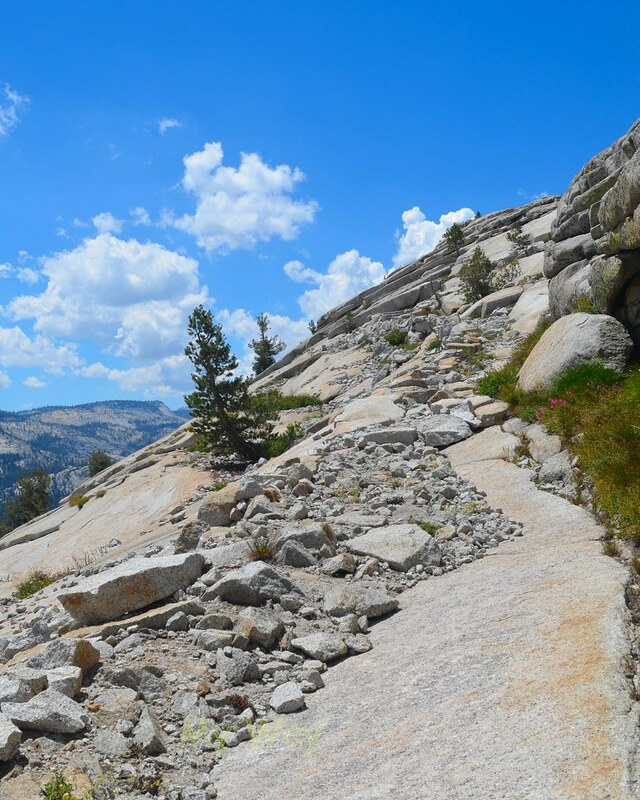 I may be mistaken, but I believe that photo is of the switchbacks headed up to the pass right before Raisin Lake. The cross-slope looks familiar, although the last time I did it it was covered in snow and pouring rain. You can see that it's pretty exposed, and if you do decide to go up to May Lake, you can expect another stretch, just without the cross-slope, but you get some idea of what to expect. You are quite welcome. Thanks for reading my TR. I am not quite sure where. But it is between these two pix below. I think it was before one of those marks left by dynamite explosions from long time ago. I could be wrong, but very positive.